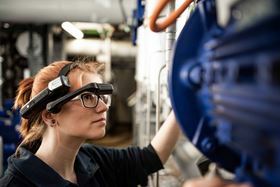 ACHEMA will take place from 11 – 15 June and KSB Service will be presenting its augmented reality which supports its pumps and valves service. The company will be working with data glasses linked with the Internet, or with a smartphone app. The devices can guide users or technicians through their service work with advice from an expert, either by video or audio. The experts can assess the situation through the eyes of the person present at the site. This helps instruct technicians who are not pump specialists to carry out simple maintenance step by step. The data glasses can also be used to transmit exploded views or screenshots that can then be viewed in the corresponding field. The required spare parts can then be identified and the procurement process started in order to prepare for any work that might need to be performed by a KSB service engineer. At the KSB Stand H14 in Hall 8.0, visitors can try the system out first hand. They can be guided at a prepared pump by an expert via the data glasses. KSB Group buys the US pump service and sales company Dubric Industries Inc.
KSB extends range of large dry-installed wastewater pumps.